Boosting Africa’s intra-regional and international trade requires a good understanding of the African trade finance landscape, including the identification of markets where the need is greatest. This column presents some of the major patterns of the market in Africa using primary survey data from commercial banks. Banks intermediate almost a third of trade activities across the continent, but still reject a significant value of trade finance applications mainly due to weak client creditworthiness and inadequate collateral. One of the observed features of global trade is that Africa consistently accounts for a limited share – less than 5% in terms of exports (Figure 1). For decades, trade experts have identified several factors for this low participation. From low productive capacity to high market access barriers, the literature is rife with myriad explanations. However, not much has been written about access to trade finance and its impact on Africa’s participation in international trade. For policymakers, such a knowledge gap presents significant challenges for appropriate trade policy formulation and implementation. To overcome some of this knowledge gap, in 2013 the African Development Bank (AfDB) started collecting data on trade finance activities of commercial banks across Africa, which culminated into the publication of the first continent-wide Trade Finance in Africa report in 2014. The aim is to track and estimate the size of bank-intermediated trade finance, magnitude of the financing gap (unmet demand) and supply-side challenges among others. A second survey was conducted this year (AfDB 2016), the findings of which are briefly presented here. 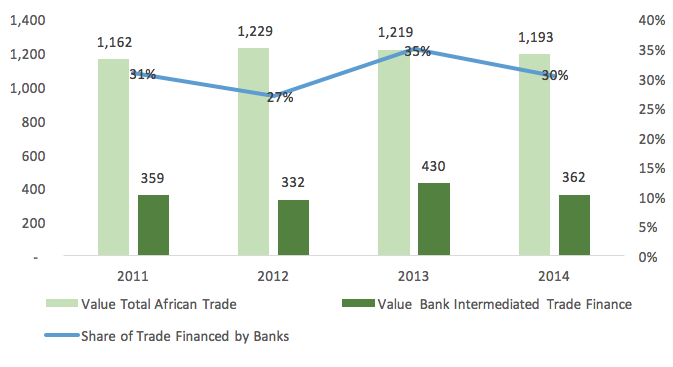 The size of bank-intermediated trade finance in Africa averaged about $371 billion from 2011 to 2014 (Figure 2) and represented approximately 31% of total African trade. This relatively low level of intermediation suggests that a significant share of African trade still relies on inter-firm trade credit through open accounts as well as cash-in-advance transactions. In terms of distribution by client segment, a disproportionate share (58%) of bank-intermediated trade finance is on account of banks’ top 10 clients. Although SMEs constitute more than 80% of enterprises in Africa, they account for only 28% of banks’ trade finance portfolio. Unmet trade finance demand is a good indicator of banks’ capacity to provide trade credit, but estimating the size of this gap is often a tricky task. Using the estimated size of bank-intermediated trade finance and the rejection rate of customer requests by banks, the trade finance gap in Africa is conservatively estimated at $91 billion in 2014. Although this represents a decline compared to previous years, there is an emerging and consistent picture that the gap is still significant and ranges between $90 billion and $ 120 billion (Figure 3). 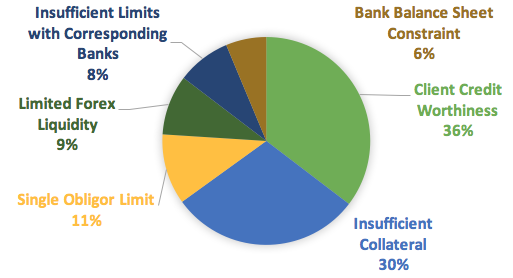 Although trade finance assets are often short-term and asset-backed (in terms of the traded goods being financed), banks still cite poor client creditworthiness (36%) and insufficient collateral (30%) as the main reasons for rejecting trade finance demands by clients (Figure 4). We believe these reasons reflect the generally weak credit assessment infrastructure in Africa rather than any peculiarities of the trade finance market in particular. In spite of the difficult credit risk assessment environment, trade finance is still considered by banks in Africa as a relatively low-risk activity. 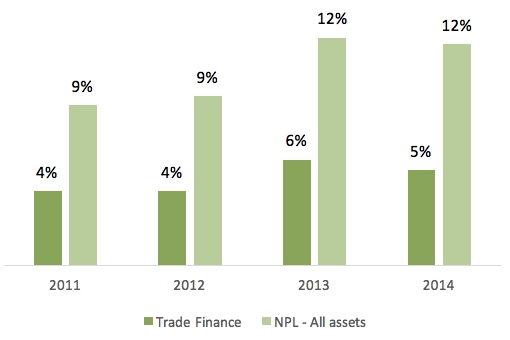 For any given year in our study, default rates on trade finance assets are significantly lower than the average non-performing loans ratio (NPLs) of other asset classes (Figure 5). This lower risk profile may be explained by the fact that trade finance transactions are generally asset backed, short-term and self-liquidating. However, this default rate is relatively high compared to other regions where the default rate on trade finance assets is lower than 1% on average. 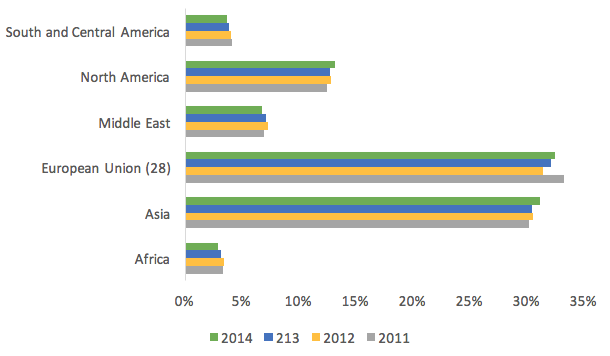 A large proportion of Africa’s trade is with the rest of the world rather than intra-regional. In 2014, intra-African trade accounted for only 15% of the continent’s total trade compared to 63% for the EU, 50% for North America, and 52% for Asia respectively. However, across all years for which we have data, the share of bank-intermediated trade finance dedicated to intra-Africa trade is higher than the ratio of intra-Africa trade to total trade (Figure 6). This suggests that intra-Africa trade does receive its fair share of trade finance in Africa. Trade finance in Africa is a relatively unexplored topic (recent studies on Africa include Humphrey 2009). 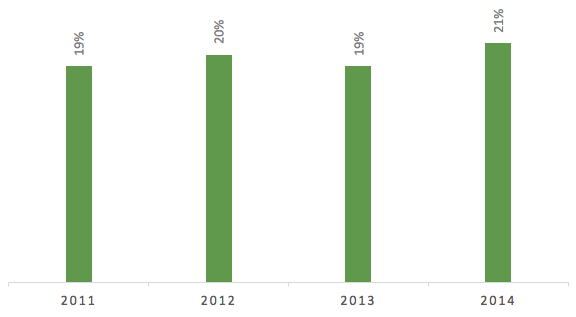 In this column, we have presented some of the major patterns of the market in Africa using primary survey data from commercial banks spanning 2011 to 2014. We note that banks intermediate almost a third of trade activities across the continent, but still reject a significant value of trade finance applications mainly due to weak client creditworthiness and inadequate collateral. 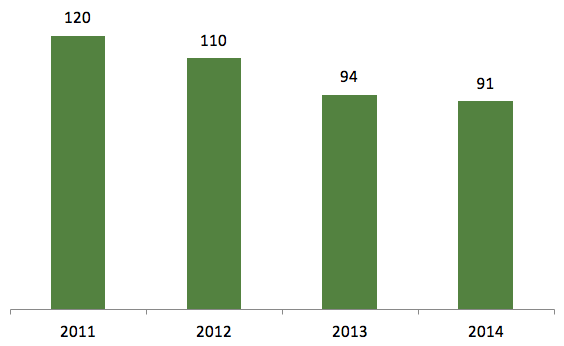 The financing gap is still sizeable, in the region of $90 billion to $120 billion. A disproportionate share of the available financing is provided to large corporates (top ten clients) at the expense of SMEs that make up more than 80% of all businesses in Africa. By helping to improve the credit assessment environment and providing targeted support for both banks and enterprises, particularly SMEs, national governments and development finance institutions can play a significant role in improving the trade finance landscape in Africa. AfDB (2016), Trade Finance in Africa: Overcoming Challenge, African Development Bank. Humphrey J. (2009), “Trade financing: Is it a barrier to Africa's exports?”, VOXEU.org, 28 April.